Today VMware announced updates to 4 major products with vRealize branding (3 within the suite and 1 not). Even though the version increments are small, the features they bring are not! 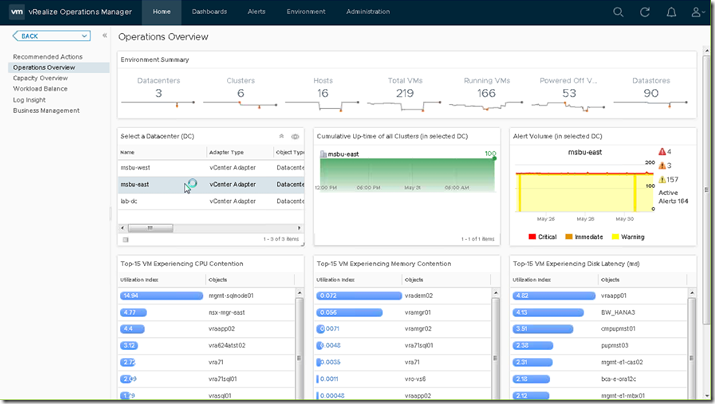 vRealize Operations, Log Insight, Network Insight, and Business for Cloud have all received updates. So lets get started, shall we? 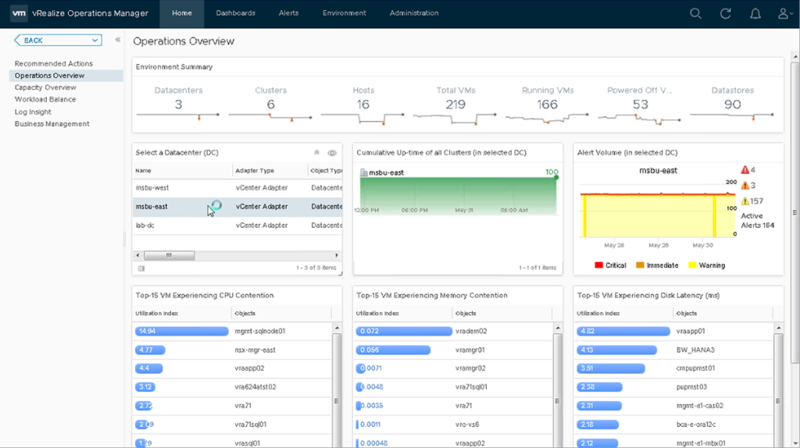 Right out of the gate, you will notice something very different in this build of vRealize Operations (lovingly known as vROps). That’s right, they’ve embraced HTML5! If you’ve been using the HTML5 client for vSphere, you’ll see this looks very familiar (its the same underlying engine in both). It is great to see VMware continuing to phase out flash and embrace something everyone can use. Also in this build is a revised “Getting Started” page. More and more people are just starting out with adding vROps into their environment, and making the product easier to new comers is always welcome, just make sure there is an easy way to dismiss all the getting started notifications for the power users . These new dashboards are based on types of rolls (Operations, Troubleshooting, Compliance, etc…). Combine these with greater out of the box integrations with things like vSAN, Log Insight, Automation, and you’ve got a pretty powerful tool to get started with. One of the other big new features arriving in this update revolves around DRS. 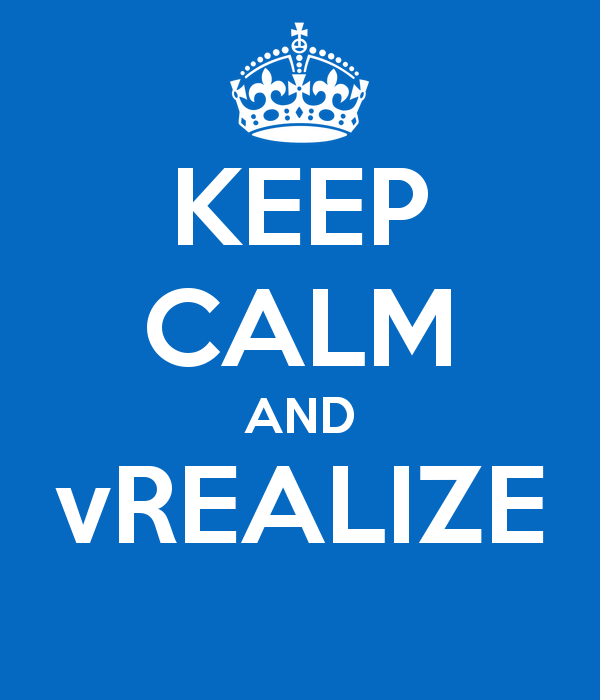 Imagine, if you would, that you could enhance DRS with the power of vROps. While by itself DRS is fantastic for load balancing in a cluster, now you can load balance across the entire datacenter. This new combination will allow you to automatically move workloads to different clusters and different datastores. Now, take it one step further. While DRS by itself is a reaction based process (it only kicks in once there is resource contention), when you can utilize the analytic engine of vROps you can get ahead of the curve. 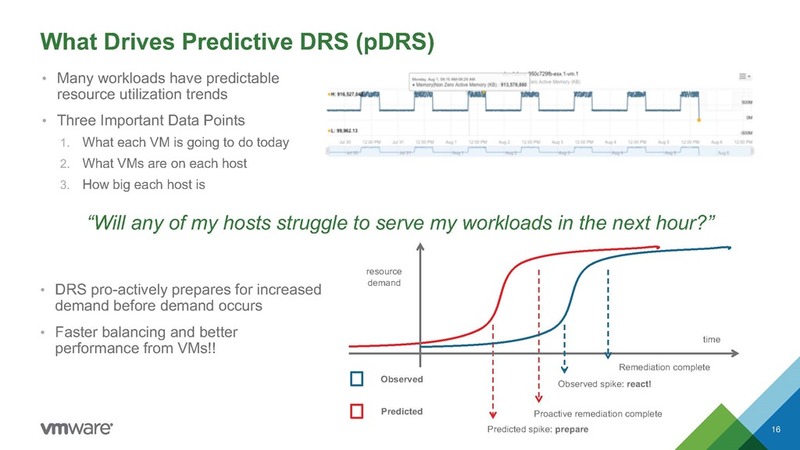 Spotting patterns in workloads will allow DRS to move things ahead of time to ensure that your VMs have the resources available before the increase in load. They call this Predictive DRS (pDRS). I’ll be looking into this further in a later post, but this has the potential to be a real game changer for VMware. And finally, one last thing, and I thought this was a bit interesting. There has also been development around hardening / compliance. 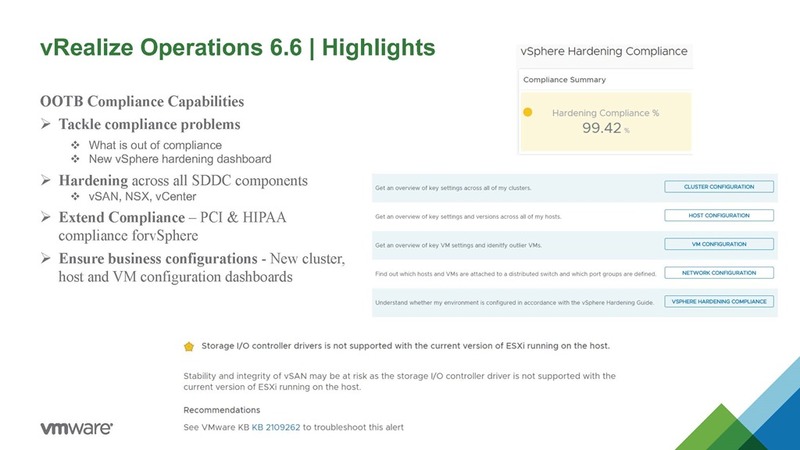 There is a new dashboard that will tell you how hardened your components are (based on VMware’s hardening guide) and how compliant things are. This even goes so far as to checking your environment against HCL. This update is a bit smaller than the vROps one and it revolves around vROps as well. In this update, they’ve added closer integration with vROps. In fact, now you can launch Log Insight directly from the vROps dashboard. 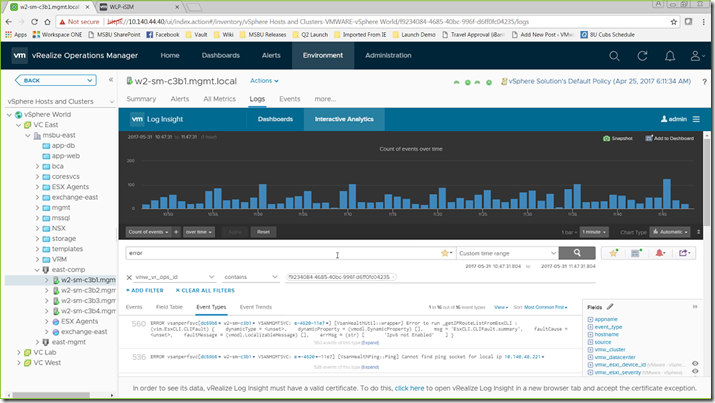 You can auto initiate log management to get to the bottom of the alerts you are seeing in vROps. Now to achieve this, they had to make more enhancements to the single sign-on support, so it would seem this is working better. The updates coming to vRNI revolve around a few key areas. First, if you are an enterprise customer, you will now be able to manager security with your cloud integration with AWS. You’ll be able to EC2 instances to application groups for micro segmentation, have visibility into AWS flows and security groups, and triage AWS traffic issues. For those of you without enterprise license, you can expect to see greater ability to troubleshoot between physical and virtual infrastructure. You’ll be able to gain insight into issues involving the underlying layer 2 network as well as gain enhanced traffic and security analytics from physical servers. One last enhancement is ability to take vRNI generated events and export them to a syslog, which would be of great use in Log Insight. Now I’ll admit, this is the product that I’m the least familiar with. For those of you not familiar with this tool, its great for larger environments that want to get a handle on hybrid cloud. You can break down your costs of your VMs and map them against various providers to get a cost analysis. In this update Azure has been recognized as a major player in the cloud market, and has been promoted to that status within the analytics engine. The AWS integration has also been improved with enhanced VM level statistics. There are also some new out of the box reporting capabilities. One of the best ones is a new Daily Pricing Report. Administrators can configure a daily email (or spreadsheet) that will itemize your datacenter costs so that you can keep better track of costs. Its great to see more enhancements to these products. Its clear that vROps is getting a long needed overhaul and being placed in the center of things, with it’s ability to reach into every product and maximize it’s benefit. If you haven’t had the chance, i urge you to give it a try and see what it can do for you. As VMware embraces Amazon and Azure, they want to make sure you also get the most out of it, which is why we see these additional enhancements in that space as well. Tagged Predictive DRS, VMware, vRealize, vRealize Log Insight, vRealize Network Insight, vRealize Operations, vRNI, vROps. Bookmark the permalink.